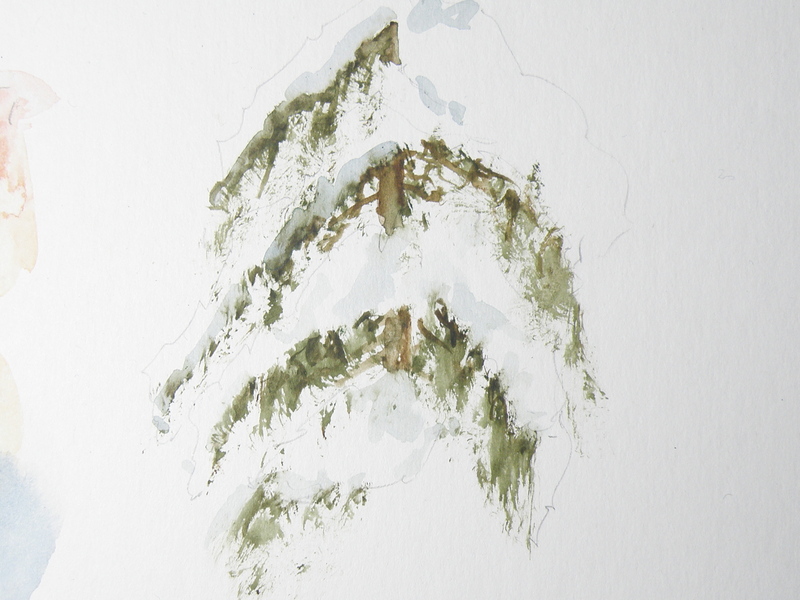 Snow-laden firs and pines aren’t the easiest of subjects for depicting in watercolour–(at least not for this painter). The challenge comes in first understanding the effect snow has on branches, for, obviously, there is snow and then there is snow–each snowfall having its own unique effect. That crystalline, hardened seizing of tender branches by icy snow pulls them heavily towards the ground, while sub-zero powdered flurries creates a mere dusting of needles–each presenting technical challenges. Of course, the problem is one of always having to paint around the white of the paper allowing it to ‘be’ the snow in watercolour. Given that opaque white can’t be used, a light dusting on pine needles becomes really quite a bit more difficult than painting the after-effects of a full-blown blizzard. Leaving minute dots of paper surrounding green needles is a recipe for madness in my book. Give me a snow-stormed pine any day of the week in its place. Figuring out just where branches are on a given variety of pine, fir, balsam, cedar or spruce is key to understanding where snow will sit when on them. So it seems crucial that any study be limited to particular species, (in the above case, cedar) — otherwise, a painter of representational art will be in danger of ending up with a kind of ‘marshmellowed’, generic evergreen most often seen on Hallmark Christmas cards. Truly, each variety of coniferous tree accepts snow in its own unique way. A blue spruce, for example, with its stiff, jutting branches, is much more able to bear the weight of snow than the red cedar in the above study, whose branches are prone to drooping and bending. This study was done on leftover piece of plain white matt board, using a chopped-up small fan brush to go after the greens, then a more pointed, conventional brush to soften the hard edges and provide shadowed depth to the snow. The branches aren’t quite correct. Once snow is included, it changes perception to such a degree, I have trouble understanding where it goes and branches fall. The beauty of our being blessed with so many evergreens to choose from comes in knowing that each one offers the student of watercolour great and intriguing challenges, especially when brimming with that wonderful adornment–snow.